Data are both process and products of the research enterprise. Funding agencies are requiring data management plans as part of grant proposals, journals are requiring the release of data to reviewers and readers alike, and libraries and archives are adding data to their collections. Researchers are acquiring skills in data handling as part of graduate programs. Managing data is a complex process, involving expertise in technology, knowledge organization, information policy, and in the research domain. 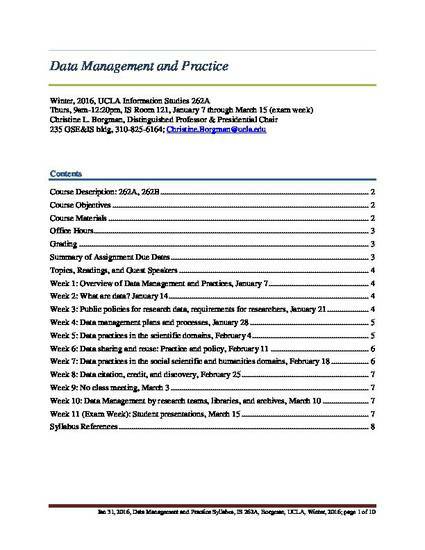 These two Information Studies courses (262A and 262B) survey the landscape of data management, practices, services, and policy, including the uses of data in the sciences, social sciences, and humanities; data management practices (e.g., metadata, provenance, technical standards); national and international data policy (e.g., intellectual property, release policies, open access, economics); management of data by research teams, data centers, libraries, and archives; and data curation, preservation, and stewardship. The courses are intended for graduate students in information studies and in any domain that requires the management of research data. By bringing together students from across campus, these seminar courses will engage students in practical, professional, and theoretical challenges in the use and reuse of research data. Assignments include analyses of data archives, data management plans, curating data for a research team, and domain-specific activities. Students will work in teams with UCLA researchers and will make class presentations. The course provides basic foundation on data issues for masters and PhD students concentrating in libraries, archives, informatics, information policy, scholarly communication, and to students in other disciplines.